SASHIMI TIME: ChrisVasilevski's 71kg tuna off Portland. Anglers only had to visit Geelong’s waterfront to snag themselves a fish last week. Cunningham Pier fished exceptionally well for snotty trevalla and mullet on paternoster rigs with chicken baits. Australian salmon still schooled in vast numbers along the waterfront, popping up from the yacht club though to the rocks at St Helens. Boat anglers found a surface frenzy near Point Henry, where casting metal lures worked a treat. Garfish were still present too, with huge schools holding just out from the rock wall at Limeburner’s Point. Clifton Springs’ squid keep everyone busy. Size-three jigs produced better results, especially in green or white colourations. St Leonards was tough going for bag-limit captures of whiting, although some nice-sized fish over 40cm were taken. Point Lonsdale Pier produced huge salmon on the last of the incoming tide. Pilchards and metal lures caught fish to 3kg banked. 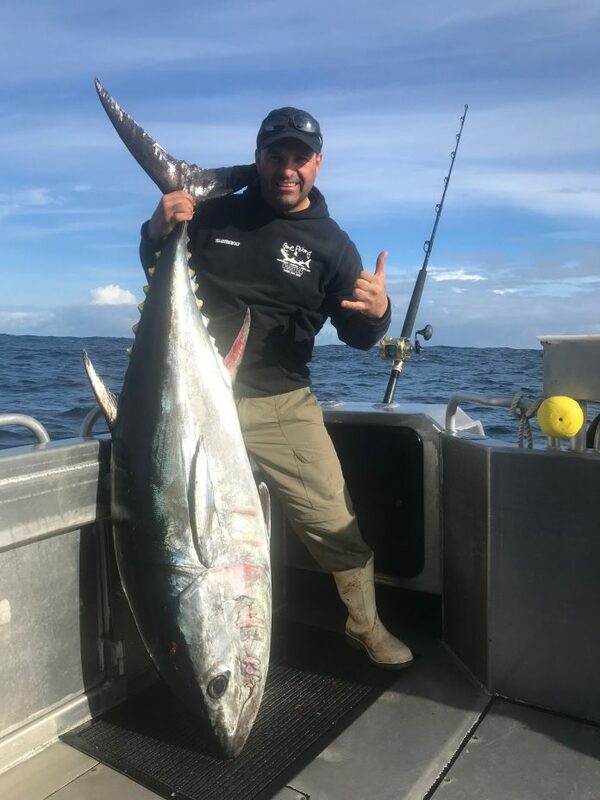 Down the coast, Gone Fishing Charters’ Chris Vasilevski guided clients onto a fantastic southern bluefin tuna of 71kg off Portland. The tuna took some work to subdue, being hooked on 15kg line. Plenty of school tuna are holding of Portland too, with skirted lures and X-Rap 20s doing the job. Highton’s St Augustine’s Waterhole fished well after a stocking with rainbow trout for school holidays. Light running-sinker rigs with Powerbait on the end caught fish, along with hard-body lures like a Rapala F-5. Lake Bolac remained a hot spot for rainbow trout, with fish just over 2kg engulfing Powerbait. Trolling lures also worked, particularly Tassie Devils. Even further west, the Glenelg River is produced some of the best mulloway fishing for years. Smaller profile-lures indented for bream anglers caught mulloway over 80cm, along with some well-conditioned bream and estuary perch. Next week should offer more top fishing along Geelong’s waterfront for salmon on lures, while kids will enjoy fishing for trout at St Augustine’s Waterhole.